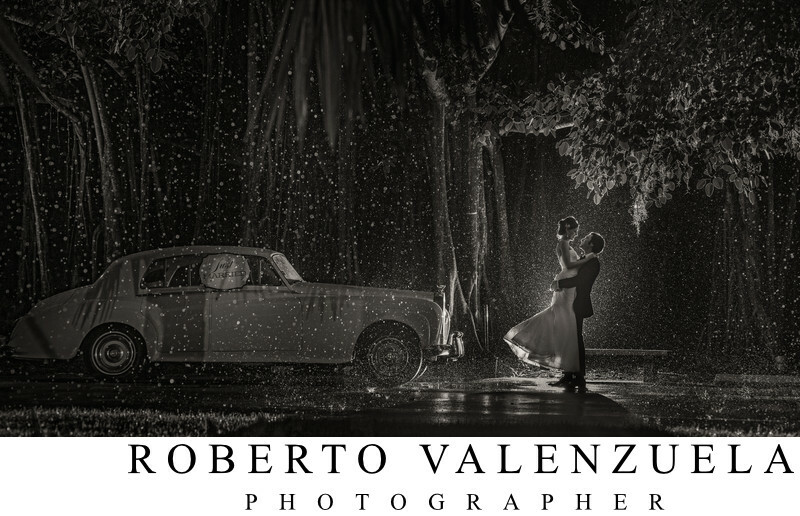 This photograph was taken late in the evening as the wedding came to an end at the Ringling Museum of Art in Sarasota Florida. This photo has to be one of my all time favorite wedding photographs in my career. It was also used by the camera company Canon USA as their national ad for the camera I used, the Canon 5D Mark III. It had been raining all day and all night due to a hurricane passing by the area. To take advantage of the rain, I asked the Rolls Royce driver if he could park the car in front of the tree. I then asked my assistant to stand in front of the grid of the car with two Canon 600EXRT flash units. When everything was set, I then asked the bride and groom to run out quickly and lift her up. The photo took only seconds to take, and we all got a little wet, but the photograph is magical and it will last forever! Location: Ringling Museum in Sarasota, Florida: 5401 Bay Shore Rd, Sarasota, FL 34243.